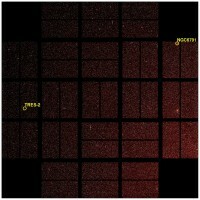 The Kepler Mission is a spacecraft that stares at the same 100,000 stars. This is all for the sake of discovering Earth-sized extrasolar planets by detecting variations in the brightness of a star with periods that can last over a year. It would be impossible to allocate years of telescope time for observing just a single star, and even if an astronomer manages to get that time, the star might not even have a planet, which is why Kepler observes 100,000 stars all at once. Not to mention that thousands of planets could be discovered this way at once, instead of praying that the single star you are observing has a planet. Given Kepler's goals, it would be nice to make sure that it could actually detect planets. And as reported at Bad Astronomy, Kepler has managed to detect the known planet HAT-P-7b, an extrasolar planet that orbits its parent star with a period of 2.2 days. Now that Kepler has been shown to be able to detect known planets, we can be much more confident that it could indeed discover new planets, hopefully including those that are as small as our own Earth, without having to twiddle our thumbs for years wondering if Kepler would even work. Kepler has been successfully launched, and over the next three and a half years it will look at a single patch of sky in search of planets. The spacecraft is sensitive enough to detect the existence of planets even as small as our own puny planet, Earth. It does it by detecting the very slight dimming of starlight as a planet moves in front of its parent star. It also looks at many stars at once so that it astronomers would not have to pick a star at random, just hoping that the planet's orbital plane is at the right inclination and that the planet just passes in front of the star when Kepler is looking at it. With orbital periods of a year or more like our own Earth, keeping watch of many stars at once would have to be the way to go. Two exciting announcements for astronomy enthusiasts have been made nearly at the same time. Not only have the first direct observations of an extra-solar planet have been made in visible light, there has also been the first direct observations of a multi-planet system around a normal star. Continue reading "Extra-solar planetary milestones"
Image of planet around Sun-like star? 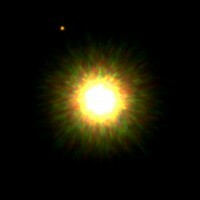 Canadian astronomers have used the Gemini North telescope at Hawaii to obtain what may be the first image of a planet orbiting another star similar to our own Sun. The spectrum from the light of the supposed planet indicates that it is too young and too small to be a small star, so they believe that it is indeed a planet. However, they will still need to use more traditional techniques that measure the effect of the planet on its parent star, such as wobbling due to the mutual gravitational pulls or a tiny reduction of starlight as the planet passes in front of the star, to confirm that it is really a planet and not a small star that just happens to look like it's nearby. This could take a couple of years. If you're interested in this kind of news and yet first learnt of it here, head over to the Bad Astronomer, who has an excellent writeup about the observation.